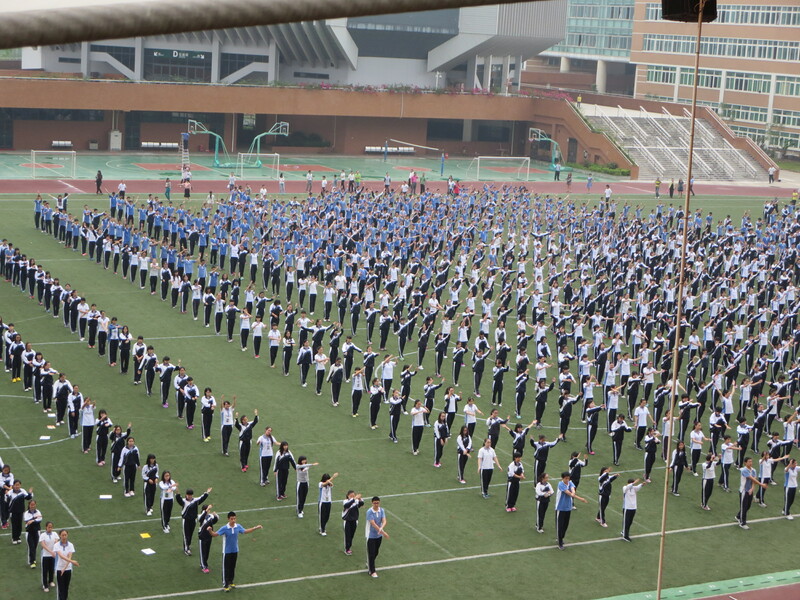 I was finally out of the apartment early enough one morning to witness our students doing their morning exercises. They do this every day, but this was the first time I saw it. They just stand there, flailing to weird 80’s montage music. Seriously, it sounds like the theme music from the A-Team. I giggled and took pictures, but I digress. Recently, life has been pretty awesome. We’ve been hanging out with more of our CTLC friends and they’re delightful. 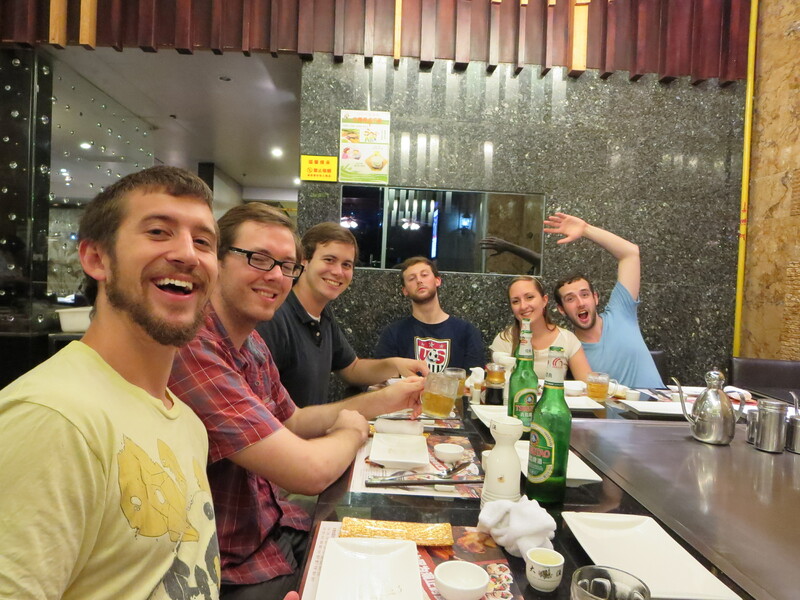 A few weeks ago, we went out to a teppanyaki restaurant to celebrate our friend Ariel’s birthday. It was super delicious and fun. Bringing a New Orleans birthday tradition to China. This man makes tasty food. Gigantic lobsters. However, that one’s not looking so good. It’s not the easiest thing to listen to. Pictures for family back home. This place is about a 15 minute bus ride away from us and we had almost no idea what was there (except for seafood, that was a given). Our friend Kane set up a night for us Yantian folk go head out there and enjoy some of the best seafood China has to offer. We ate a ton of shrimp, clams, and other assorted fish. It was wonderfully delicious, albeit a little pricey. We’ve slowly been discovering more and more tasty food places around us and I hope to write more about them soon. Apart from eating very well this past month, Spenser and I also took part in one of our favorite holidays, Halloween! We both had awesome Halloween-related lesson plans for our students that week; in fact, I successfully managed to scare the crap out of my kids with a video featuring Michael Jackson’s ghost. It was wonderful and easily one of my favorite teaching moments so far. On Halloween night, we attended a great CTLC Halloween party where almost everyone went above and beyond on their costumes…including us. So, I might have gone a little overboard. 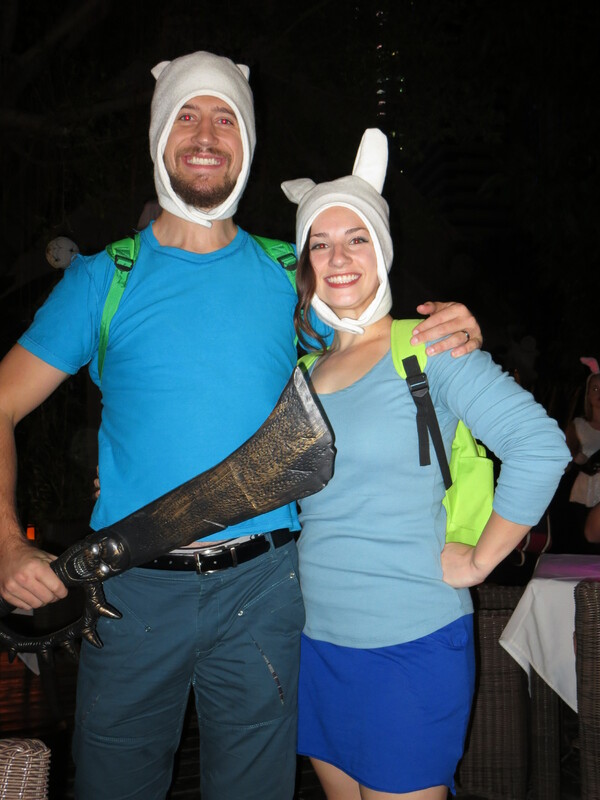 Spenser and I are big fans of the TV show Adventure Time, so we went as two of the main characters, Finn and Fionna. This means that we had to trek through the horrid land known as Dongmen to find the parts for our costumes. Everyday in Dongmen is like Black Friday. It’s awful. People are yelling, music is blaring, everyone is clapping and trying to get you to come into their stores. It’s a stimulation overload. It was so overwhelming, I forgot to take pictures, but trust me, Spenser and I were not happy after spending just a few hours there. 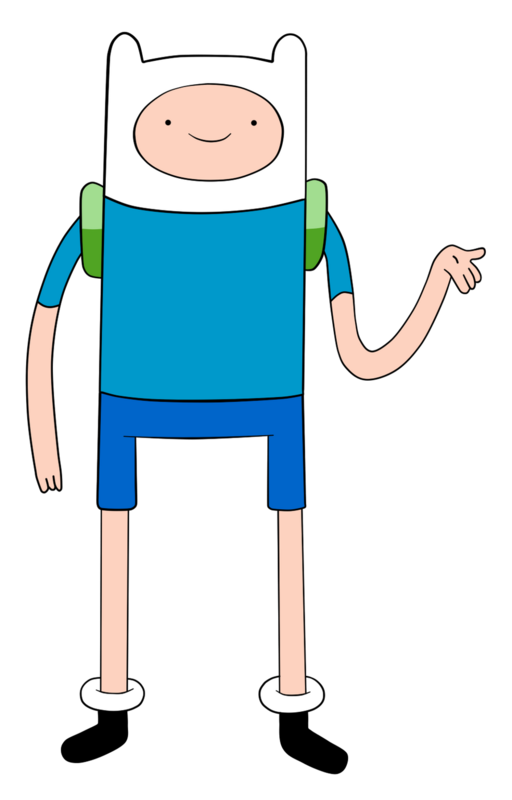 Nevertheless, we eventually got our Finn and Fionna clothes, and I then spent the next few days hand-sewing our hats. Once they were all put together, all the hard work was worth it. This was my favorite Halloween couple costume for us since our first Halloween together: we were The Monarch and Dr. Girlfriend from The Venture Brothers all the way back in 2009. Yes, China is getting better and better every day. Adrianna, we love following your adventures in China. I know you are becoming a great teacher and making memories for a lifetime. Have fun! Ha ha ha! Those were fantastic costumes – and I think yours were the best! Although “Error” and “Government Shutdown” we’re also cool. New Orleans was pretty much rained out which was just sad this year. Everyone asked about you guys – we raised several glasses in your name!